There’s always a lot going on during this time of year: pumpkin-spice-flavored everything, leftover Halloween candy, the time change, stores breaking out the Christmas decorations, Thanksgiving, and Black Friday. But I’ve added something else to mix over the last four years, Movember. No, I didn’t misspell November, it’s actually called Movember, and it’s a movement that asks men to grow mustaches from Nov. 1-30 to raise awareness (and funds) for men’s health issues like prostate cancer, testicular cancer, and mental health. Movember was started by a couple of guys in Australia and has exploded in popularity — raising $650 million globally and funding over 1,000 programs — since it began in 2003. 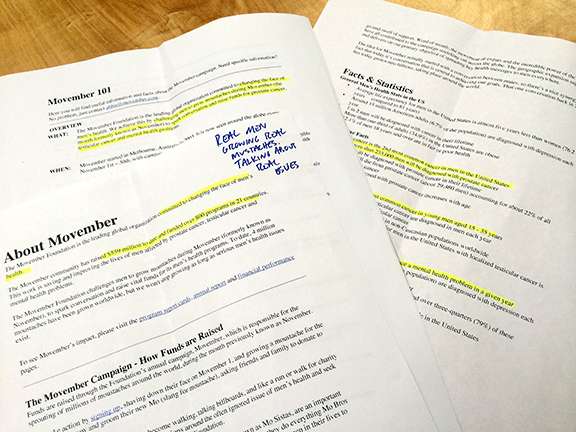 In 2014, $89.2 million was raised in the name of Movember, with $20.2 million coming from the U.S.
How it looked back in 2012… when I didn’t know the rules. 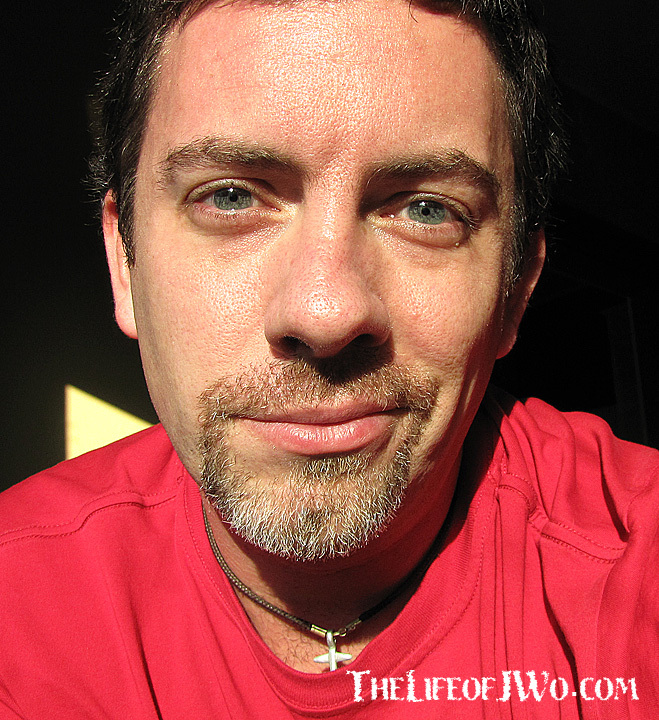 I first heard of Movember from a blogging community back in 2012 and thought I’d join my fellow bloggers by sprouting a hairy upper lip and attaching it to my goatee. I didn’t know it at the time, but it turns out that was against the rules. 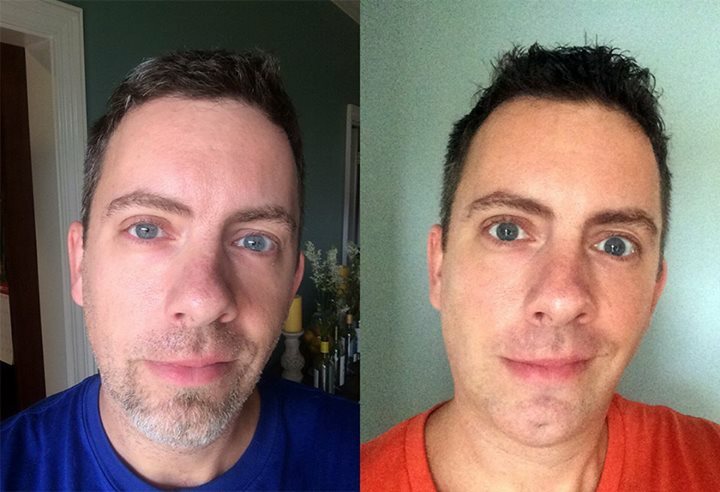 In fact, I broke the first rule, which states you must start with a clean-shaven face on Nov. 1. When I realized my mistake, I vowed to make things right in 2013 and launched my campaign at my new job. Five coworkers joined me in sprouting hairy upper lips for the month and it was a blast. The team we were part of in 2013 raised just under $700 for Movember. When it came time for the 2014 campaign, I branched out on my own and launched a new team (MovemberMania) with hopes of continuing to grow Movember, but I had no idea what was in store. In fact, never in my wildest dreams would I have imagined how things turned out. I reached out to my favorite morning news show in Memphis in hopes of getting some of the hosts to talk about Movember and how to donate. When my favorite weatherman, Joey, contacted me about coming on air to discuss it with him I was stricken with excitement and nervousness. I bought mustache-themed gifts for the hosts (coffee mugs, socks, bow tie) and even had mustache cookies from my sister’s bakery to thank them for having me. 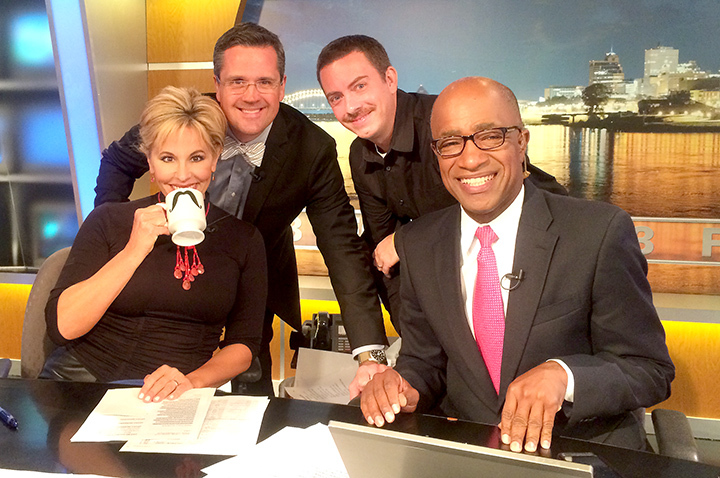 Some of the mustache mugs I gave the Good Morning Memphis crew. These are just some of my Movember notes. I crammed all weekend for my first appearance on live TV. I learned as many stats as I could, like how Movember started, that prostate cancer is the second most common cancer in men, how testicular cancer is treatable with early detection, how much money was raised, programs funded, etc. I recited my stats while I paced nervously behind the scenes waiting to go on air. I tried NOT to be stiff as a board when I got on air and thankfully Joey helped carry me through the segment, which went by so fast. Valerie, Joey, me, and Ernie on the Good Morning Memphis set. 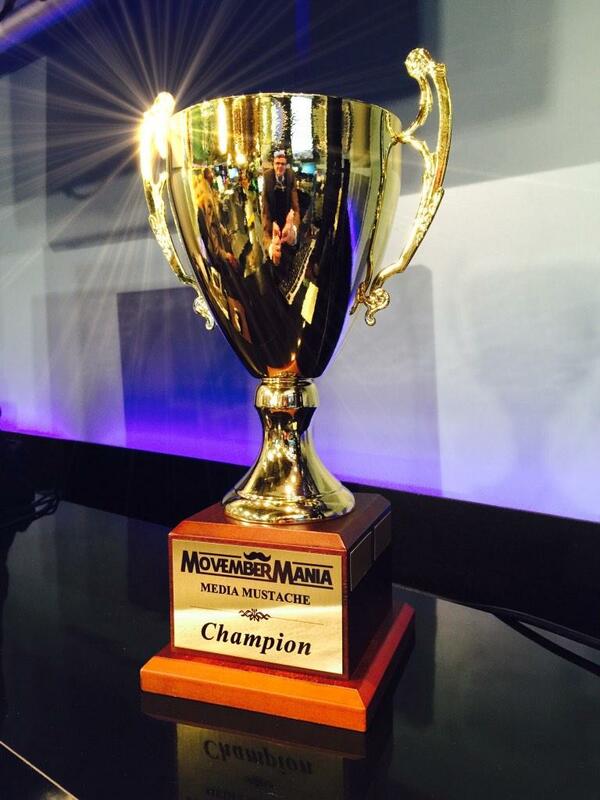 The MovemberMania Media Mustache Champion trophy. Then Joey and Matt (sports guy) joined MovemberMania and began competing against each other to see who could grow the best mustache on air. 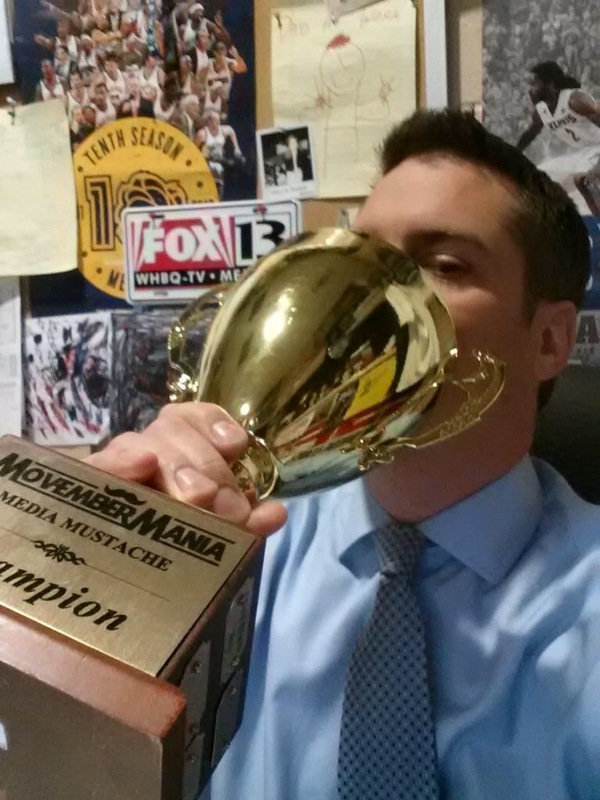 When I saw what they were doing I knew I needed to do something to reward the winner, and decided to create the MovemberMania Media Mustache Champion trophy for whoever raised the most money. What unfolded next was beyond anything I could have imagined as Joey and Matt talked about their mustaches and Movember nearly every day of the month. Joey even shaved off his mustache LIVE ON-AIR during his last TV appearance of the month. In the end Matt ended up edging out Joey in the fund-raising department and Matt has been enjoying the trophy all year. With their help the MovemberMania team doubled its goal of $1,000, raising $2,096. I was hoping to have Joey and Matt competing on air once again in 2015, but their station went through some changes during the spring, which meant neither could compete. I’ll admit that I was disappointed, but not defeated. I scoured the Memphis area for other media members to challenge for the trophy and have come up short. While Movember may not get as much publicity in Memphis this year, I’m not pouting or giving up. I’m still here and I’m still taking part in Movember. I started the month clean-shaven and will be carving out a sweet mustache once my mustache seeds start sprouting. I’ll post updates to my mustache in the coming weeks. It’s not too late for you to join the MovemberMania team and you can do so here. If you’d like to donate to the cause, you can do so here. Every bit helps. Gallery | This entry was posted in 2015, Daily Life, Movember and tagged daily life, Donation, health, humor, life, mens health, Movember, Mustache, mustaches, people. Bookmark the permalink.